Recognition of the vital services Wintergreen Rescue provides to the community has come in the form of major financial support from state and local government. Wintergreen Rescue will add automatic loading devices in two more ambulances this year. We will also be adding high-tech airway-placement equipment in all of our ambulances. This technology will be purchased with the help of some $50,000 in matching grants from the Virginia Office of Emergency Management Services. Wintergreen Rescue was also a recipient of a large matching grant from Nelson County towards the purchase of the new ambulance. This support is a result of our community’s history of providing matching funds and how Fire and Rescue successfully provides vital services to the greater Nelson community. Grant-grading committees dive deep into our performance and financial records. If there weren’t a proven track record, we wouldn’t receive these funds. The Wintergreen community can be proud. 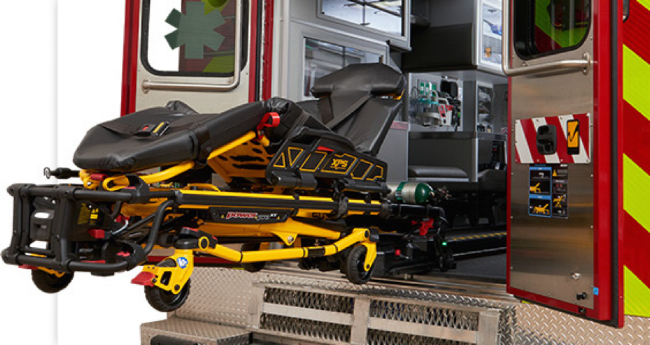 Often a crew of just two on the ambulance will not have any loading assistance. Power-Load devices provide better care and are also proven to reduce the chances of serious back injuries. The Power-Load equipment also meets the new federal cot-retention standards that hold the cot in place in the event of a vehicle rollover. All of our ambulances will soon have high-tech equipment where our medics can more easily and safely place airway devices on patients. These “video-laryngoscopes” almost eliminates issues with getting an airway set improperly. The 50/50 grant that funded this equipment was made possible due to the community’s continued financial support. Nelson County contributed $113,400 towards the cost of a new ambulance. This can pay for approximately one-half of a unit. Nelson County subsidizes the operations of Wintergreen Fire & Rescue by contributing approximately $100,000 annually. They also loan funds for equipment purchases at zero-percent interest. This is the first time, however, Wintergreen Rescue has received a grant of this magnitude from the county. Wintergreen Fire is also scheduled to receive an 80/20 matching grant from Nelson County that will be used to place a new Wildland Attack Vehicle for each station. This we equate to a gift of over $250,000.